Dean Haskins, director of The Birther Summit, was in Atlanta for the court hearing in the Georgia eligibility challenge last Thursday. His new article, GEORGIA HEARINGS — TWO OUT OF THREE AIN’T BAD is really rather interesting. Prior to the start of the hearings on Thursday, the judge called the three attorneys who were present into his chambers and said that he could award them a default order because the defendant did not show up, but the attorneys stated that they would prefer to present abbreviated versions of their arguments so that they would be on the record, in case there were any appeals. According to Haskins, the “default judgment” widely anticipated based on earlier reports of the conference, isn’t going to happen. If Haskins has it right, it’s great news in my view because it means the judge will make a decision based on the merits and even if his decision is poorly reasoned, we’ll could get something definitive on appeal (I say “could” because an appeals court might rule that the Georgia Secretary of State has no authority to remove someone from the ballot and not address the merits). In terms of the evidence presented, there was a long-form birth certificate showing Barack Obama was born in the United States, one Indonesian school document showing Barack Obama was born in the United States, one State Department internal memo from the 1970’s stating Barack Obama was born in the United States and a copy of the President’s passport showing his birthplace as Honolulu, Hawaii. At no time did any attorney mention any evidence to indicate that Barack Obama was not born in the United States. Orly Taitz only offered suspicions that various documents were fraudulent, but no alternate theory that would make the President ineligible. Judge Malihi is not going to rule that Barack Obama should be investigated for social security fraud — that’s completely outside his mandate and authority. That leaves us (and this is I think where the title of Dean’s article comes from) with the two attorneys who made a Constitutional argument based on the widely-acknowledged fact that Barack Obama’s father was not a US Citizen. Now, before proceeding with my report, let me say that, before Thursday, I had never personally met Orly Taitz. After she entered the courtroom, she approached the Media area, where I was standing with our live streaming equipment, and she asked, “Are you Dean Haskins?” I extended my hand and said, “Yes, how are you doing, Orly?” Without reciprocating the handshake, she stated, “I think it is about time for an apology,” to which I replied, “You can apologize to me anytime you want.” Through clenched teeth, Orly quietly seethed, “You’re a piece of sh*t. You shouldn’t even be here.” Classy. Dean seemed to be a nice fellow. I can only hope that he will be convinced of his error should the courts rule against him. Americans for a Better Tomorrow, Tomorrow, commonly known as the Stephen Colbert Super PAC, submitted it’s contribution report to the FEC this morning at 12:01 AM. The report shows that the Super PAC, which can legally collect and spend unlimited amounts of money to influence US elections, raised $1,023,121.24 in total. The 146-page reports lists donors and details expenditures made to influence the outcome of the South Carolina Republican Primary. It is noted that the “Romney the Ripper” ad (formally titled “Attack in B Minor for Strings”) is credited by some for the sudden turnaround in the race between Mitt Romney and Newt Gingrich, transforming Romney’s clear lead to a sound drubbing by Speaker Gingrich. Beats me. This is an example of one of those where you can’t tell a thing from a spoof of the thing. It’s a web page with lots of pictures highlighting “problems” with Barack Obama’s published long-form birth certificate. It’s a compendium of objections we’ve seen before, but with a few even more nonsensical things thrown in, and then there are the silly pictures. There is no patterned background in the bound volume. The book copy was copied onto security paper. Lots of people die when they get very old. There is a seal, just hard to see. Douglas Vogt, Orly’s witness in Georgia, testified that the seal was there. Parents’ race is self reported. Black Kenyans regarded themselves as “African” as evidenced by the 1962 Kenya census forms. None of the other period Hawaii birth certificates have one either (and here one begins to wonder seriously about whether it is a joke). None of the other period Hawaii birth certificates have weight either. Lee Harvey Oswald? Pre-printed on form. Who is the guy in the diaper? Layers are a normal result of PDF optimization. Pakistan? You mean Indonesia, and no. I’ve selected a new hosting company for this blog, one that I have reason to believe will provide better service. However, the new installation will require an extensive amount of my time for setup and migration. Sooo, less time to write for a while. The graph (right) shows the number of visits to to the blog from January 20 – 31. 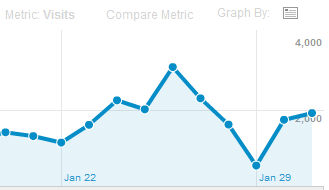 You can see the effect of interest the Georgia eligibility hearing on January 26 and the effect of the site down time on the 29th. The 2,000 visit number for January 31 is more than double the average number of visits just a month ago. The average visit consists of (on average) 5.8 page views. I talked to Chris Strunk in Atlanta last week about his FOIA request for Stanley Ann Dunham’s passport records. He was disgusted with the process and had given up. I don’t blame him. Trying to get a timely and responsive answer through the FOIA to the basic question, “when did she have US passports?” has been a very frustrating experience for me too. It’s been three years since my original FOIA inquiry. On at least two occasions the US Department of State has violated the statute by failing to respond within the time mandated by Congress. I’ve had to appeal, and my appeal proved valid since it netted me an additional (but uninteresting) document. The Department has no basis for believing that we have any additional records and all responsive records have been produced at this time. That is a very troubling response because if it is true, the Department of State has not only destroyed the 1965 passport application of Stanley Ann Dunham (which is plausible) but also the microfilm copy of the issuance card for it and that is very implausible, since documentation exists to show that cards from that period were microfilmed and to destroy it would be a violation of retention policy. Frankly I don’t believe that they have released all the records they have. That said, I already decided that, unlike Mr. Strunk, I am not going to take the federal lawsuit option. No less than Jesus Christ himself advised his followers (of which I am one) not to get tangled up in lawsuits. However, what I am going to do is to submit another FOIA request, this time in written in such an iron-clad manner that they can’t squirm out of it with squirrely language and cannot use the ploy that one person deny what another person knows is true. The Department of State has 20 working days in which to respond as to whether they will perform the search. So check back in a couple of years to see what happens.